I sometimes paint pieces that are a little different….too much something….not enough something….blah, blah, blah. I would rather a project of mine initiate a spirited conversation than none at all. I would rather it be debated as trashy or classy than just be… “nice”. See the original post by clicking the photo above. I really love how this piece turned out but not everyone liked it. It would be a dull world if we all liked the same things. 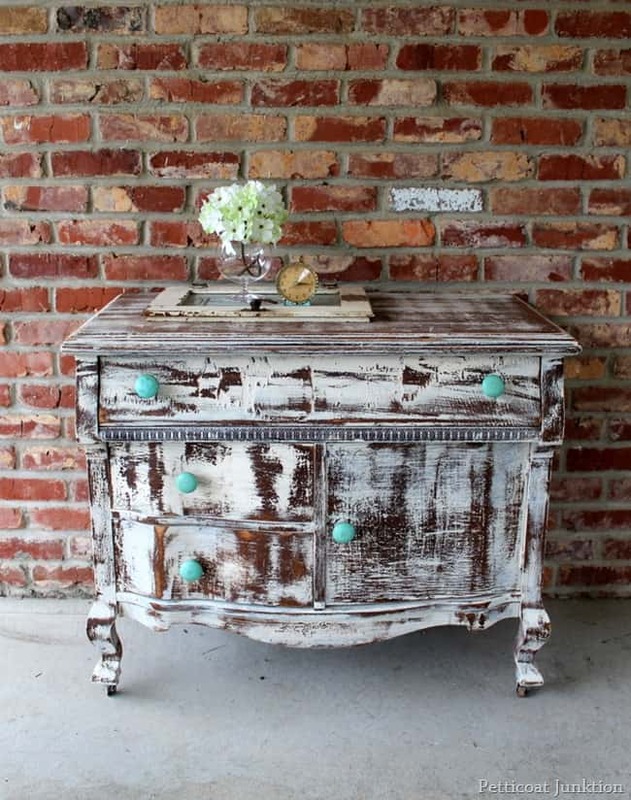 Funky Junk Donna who just happens to be one of my favorite junkers and bloggers of all time, shared this makeover on I Love That Junk and on her Facebook page. It drew more than a little controversy on her Facebook page. She deleted a few comments before I saw them because she didn’t want me to be offended. The comments I did read were well stated even if the readers didn’t like the makeover. Some of the Facebook readers were offended by the negative comments and took up for me….aaahhhh. There were over a hundred comments on the Facebook share. The statistics were….38 people shared the photo…..90 commented on it….455 likes…. The comments were probably split about 50/50, like or dislike. If you want to see the Facebook comments on Funky Junk Interiors you can click here. A closer look at the distressing. This little tree was a hit again this Christmas. The Hometalk community really enjoyed it and they shared it on the Hometalk Facebook page also. One reader called it trashy…. or was it tacky. I have looked back on past projects of mine and viewed a few where I thought “What was I thinking????”. I like my tree but it’s not everyone’s cup of tea. 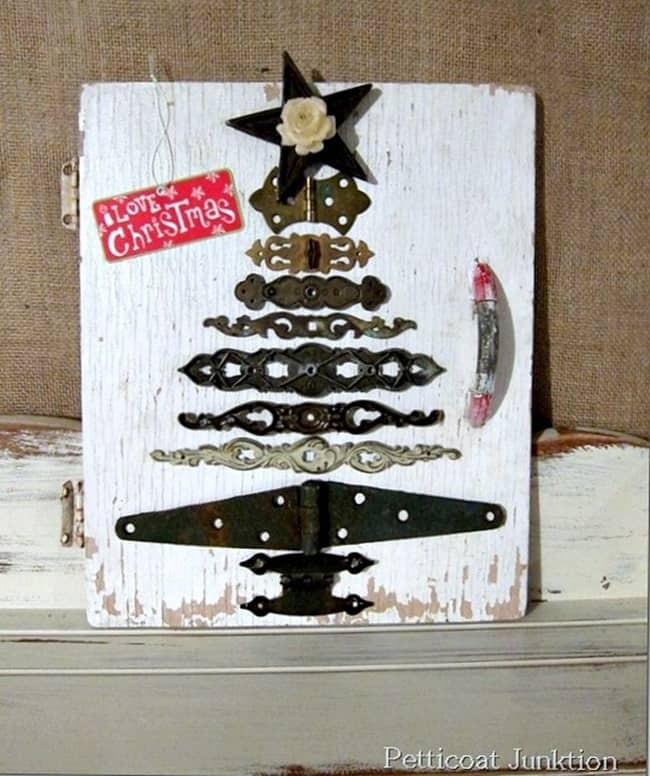 On the Hometalk Facebook page which you can view by clicking this link, the little hardware Christmas tree received 988 likes, 202 shares, and 111 comments. The majority of the readers did like this project. 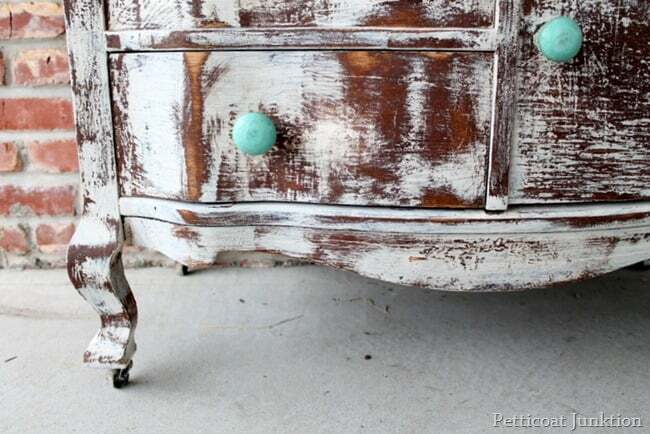 I know some of you didn’t particularly care for the heavily distressed look of the dresser and you let me know ….in a kind way…..with the comments you left on my original blog post. I appreciate your feedback, I really do, I thrive on it. So leave me a comment. I read everyone of them. I reply to a lot of the comments …. and I hate that I can’t reply to every one of them. But I promise to reply to every comment left on this post!! I am crazy about the “overly distressed” look, so I’m loving what you did. I love it….. I think it takes an artists eye to pull it off though, and you had it..
You know…. There are no Rembrandt’s hanging in my house, they are just not my taste. Just say’n! You are too funny Bliss. Thanks for stopping by! You had me at stir up controversery, I just had to click! Awesome that you followed your heart. This chest may not be for everyone but I really like it! Very crusty and cool. I have to say that you are stronger than I. If I had a blog, which I dont, and I had painted something that was similar to this, which I have, and people said negative things about my work, I would have cried. Really, I would have! So I admire your “backbone!” Seems like I have always worn my “heart on my shoulder” and if someone doesn’t like what I do to my furniture (my own furniture), I try to change it. Come to think of it, that’s silly of me. I mean, it’s MY furniture. I once heard someone say, “Surround yourself with the things you love.” I have done that, but when I see looks from others, I start to think, “Hmm, maybe it’s not as great as I thought.” 🙂 Anyway, I wanted to tell you that I really do admire you and all your work. i love the person who didn’t like the brick wall…lol. some people are determined to not like Anything! btw…i love the piece! Thanks Perri! that was a laugh!! I love that you took a risk with it. There are many things that I do that many don’t like and then I find things that I don’t care for, but honestly isn’t there room for all of it? I love your work. One day I will get to the Nashville Flea Market because of you.. Thanks Kim. I hope you make it to the flea market. I missed it this month and I am having withdrawals already! I think it’s the first one I’ve missed in at least 6 or 7 months! The anonymity that the internet brings along allows people to be rude. Why would anybody have to be mean? Didn’t mama tell you that if you can’t say anything nice, you better not say anything at all? Not everybody is going to like either piece, but there is for sure something positive to point out, even if the overall result is not your cup of tea. BTW, I love tea 🙂 I posted the Xmas tree on my Pinterest, and one day I might plagiarize it! You are so funny Gloria. Thanks for the laugh!!! Happy New Year! Thanks Chris! If the comments are civil I can deal with them! Even if they aren’t civil I usually just laugh. Happy New Year!! Great post! Any publicity is good publicity I say. I remember when u first posted the highly distressed piece I loved it and actually did more distressing on my pieces for my home! I love unique pieces keep doing it ! Isn’t it interesting what will set people off….I personally love the turquoise knobs and, in the right room, the overall look. I just find it curious that so many people felt the need to respond…but that is what blogging is all about. I look forward to more you have to offer in the coming year. Thanks for sharing! Thanks you Diane. I love for people to respond. I wish everyone that read my posts would leave a comment. Happy New Year! I love your creativity even though it is not my personal style. However, you come up with the most interesting pieces that I can always learn from what you do. On the highly distressed piece that drew so many comments, can you tell me if you applied wax to it? If so, what wax did you use? Thanks, and keep doing what you’re doing! Happy New Year. Thanks for the comment Louise. I did put wax on the top of the piece only and I used Miss Mustard Seed’s Wax. Happy New Year!!! You do good honest work! Beautiful creativity & I love following your blog! I’ll check out some of the answers after I get off work this afternoon, but rest assured, any publicity is better than no publicity! Your name — and talent — is out there & you can cetainly take the critiques! You’re a ROCK STAR! Thanks Rose. Tips and suggestions from my readers are often right on the money…and I definitely listen. I get some great project ideas from you guys! I happen to love it Kathy, but what matters is that you love it! You’re right Sonya. Thanks for stopping by!